I married Louellen in 1990 and, while I’m no shrinking violet when it comes to adventure, within hours of our nuptials she convinced me to get on a Mexicana Airline flight into a hurricane! That’s another story, however the pattern has continued these nearly 20 years. Louellen’s long time dream has been to climb Mt. 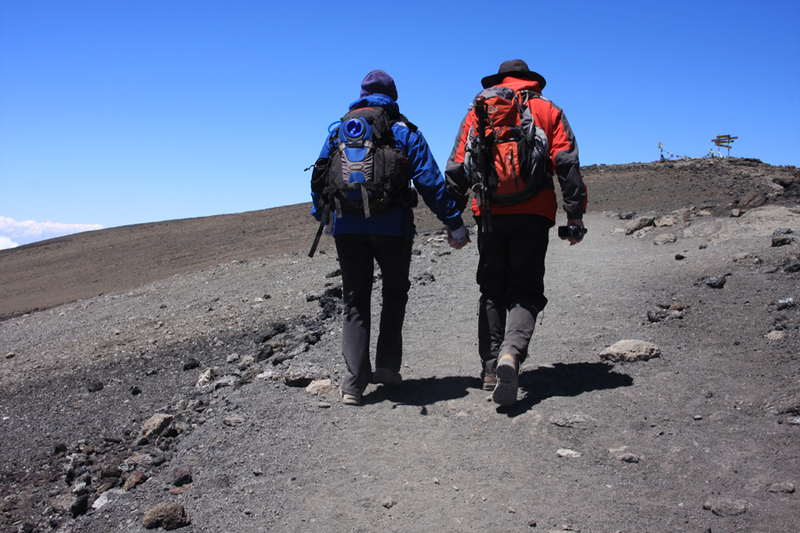 Kilimanjaro, which, at 19,340 feet, is Africa’s highest peak and the world’s tallest freestanding mountain. I don’t know where this dream came from – I’ll have to ask her sometime – but, on the day after Christmas in 2008, I find myself in Moshi, Tanzania staring at the great mountain from its foothills in this town, which, because of its frequent mists, is named with the Swahili word for smoke. Taking in the contrast of the equatorial lushness, and accompanying heat, around me and the dying glaciers nearly 4 miles above, I’m now more than a little nervous about my decision to follow my wife’s dream. Our trip will include a 13-day trek up the mountain with Tusker Trail expeditions, a 6-day safari across the Serengeti and Ngorongoro Crater with Hoopoe Safari (booked through Tusker), and then a brief rest back in Amsterdam before returning to Texas. We travel in the footsteps of Hemingway, Stanley & Livingston, and the tens of thousands of climbers and adventurers before us. This series of posts is taken directly from my Moleskin notebook, which went with me to the top, and details our time on the mountain. As much of it was written above the clouds, in what can kindly be described as a “low oxygen environment”, I’d ask the reader to forgive any variance from the grammatical norm and any undue mushiness or hypoxia-induced sentimentality. Otherwise enjoy! It’s Christmas and, after exactly 24 hours of travel, my wife, Louellen, and I have arrived in Tanzania, Africa. Our KLM Flight from Amsterdam has dropped us at Kilimanjaro Airport at 8:15 p.m., 2 hours and 15 minutes after the ever-prompt equatorial sunset. All is dark. Kilimajaro will wait to reveal itself in the morning. Our driver, Ayubu, is a pleasant man in his mid-50s, who, as I’ll soon find out, has the same abivalence toward deodorant that most folks in Tanzania will show. I ride shotgun the 45 minutes to the Keys Hotel in Moshi while Ayubu describes Tanzania’s agriculture, economy and people. After arriving, and barely avoiding immediate collapse into our beds, we have the “Special Christmas Dinner” in the hotel courtyard. Louellen, who’s been fighting a bad chili cheese dog she wolfed down at Detroit’s Wayne County Airport (the dog won, by the way . . . try 24 hours on a plane with moderate-to-severe food poisoning and you, too, might never eat a hot dog again), makes it through a few spoons of soup and a bite of Tanzanian turkey and dressing before heading to the room. A malaria pill, mosquito net, and about 3 minutes is all that stands between her and unconsciousness. I have a Kilimanjaro lager (what could be more fitting? ), which was quite tasty, and then join a couple New Yorkers at a nearby table for our Honey Banana dessert. Tanzanians are a literal people and, not surprisingly, our dessert was a banana with honey on it. Overall, I’d rate my first Christmas dinner in Africa a success. Sleep finds me pretty quickly, too, though, by 4:45 a.m., I am bright-eyed, bushy-tailed, and ready to lay eyes on the mountain!